Police found the dismembered, decapitated bodies of 15 people in two abandoned vehicles in western Mexico Wednesday in an apparent revenge killing between powerful drug gangs. 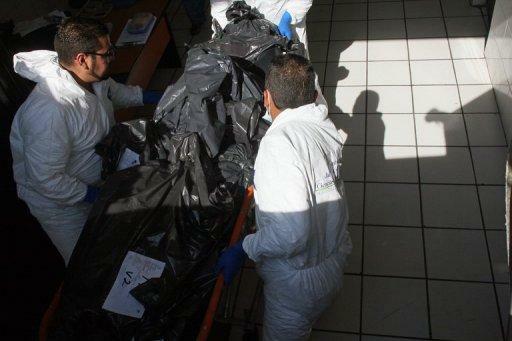 Police initially counted 12 bodies dumped in the car on a road between Mexico's second city of Guadalajara and the lakeside city of Chapala, known for its North American expatriate community. An anonymous call alerted police to the abandoned vehicles, and the bodies were taken to forensic services in Guadalajara, a police official said. Jalisco state attorney general Tomas Coronado Olmos called an urgent meeting with the state governor and said the killings appeared to have been in revenge for 23 killings last Friday in the northeastern state of Tamaulipas. An arrested woman said that the killings were "the repercussion for what happened in Tamaulipas," Coronado Olmos said. The woman said she belonged to a local gang called Milenio, linked to the brutal Zetas drug gang. Police found 23 bodies last Friday in the city of Nuevo Laredo, Tamaulipas, on the US border, including nine hanging from a bridge and 14 others that had been decapitated. Suspected drug gang violence has flared in some areas in the past week, with more than 60 deaths in massacres or fighting with security forces. Authorities blame many of the deaths on clashes between the Zetas -- a gang set up by ex-commandos that deserted in the 1990s -- and groups allied to the Sinaloa Federation of Mexico's most wanted drug lord, Joaquin "El Chapo" Guzman. The latest killings echoed a brutal episode last November when police found 26 bodies dumped inside three vehicles in Guadalajara. Based on messages left behind, authorities believe those killings were an attack by the Zetas on the Sinaloa gang. Shortly beforehand, police found 17 burned bodies in two cars in Culiacan, capital of northwestern Sinaloa state, fiefdom of the eponymous gang. More than 50,000 people have been killed in drug-related violence since President Felipe Calderon launched a military offensive on the nation's drug gangs on taking office in December 2006. The Mexican government on Wednesday announced a new deployment of troops and federal police, this time to the central state of Morelia, near the capital. Interior Secretary Alejandro Poire said the eighth such operation was necessary in the area known for the tourist city of Cuernavaca due to "criminal incidents which require stronger attention." Violence in the state, including attacks on the main highway between Mexico City and the resort city of Acapulco, has risen in recent years.